Grace & Gumption: Stories of Fort Worth Women (TCU Press, 2007) was a collection of profiles about women who moved beyond the traditional role of keeping house to make significant contributions to the history of Fort Worth. But whenever the fourteen authors of the original book gathered to make decisions, share information, give progress reports, and ask for help, they also shared wine and food. But a cookbook of recipes used by the very women who were stepping out of the kitchen? Feeding themselves and their families was as vital to the women of Grace & Gumption, as it is to women, who today stand on their shoulders. For some, cooking was a joy; for others, it was just one more chore. Some women didn't leave a food trail, but the contributors were inventive about finding 'related' recipes - some of them wonderful sounding, some, not so much. Dozens of recipes are featured, everything from skinning a squirrel to Lamb Wellington, including recipes from the Kimbell Art Museum and Fort Worth's City Club. This is a book to read for pleasure and to cook from. Recipes are standardized when that was possible without losing the charm of the original directions. Recipes have not been tested, a chore that would have been monumental. 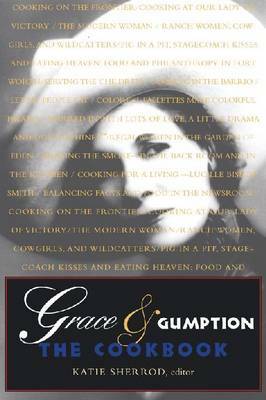 Here's a smart idea for a follow-up [to Grace and Gumption: Stories of Fort Worth Women], Grace and Gumption: The Cookbook." --Marilyn Bailey "360 West Magazine "
"[Grace & Gumption: The Cookbook isn't] your ordinary cookbook...the female writers of Grace & Gumption: Stories of Fort Worth Women, published by TCU Press...reunited for food and fellowship...and wound up creating a cookbook - touting Fort Worth women, of course. " --Patsy Miller "Panache Magazine "
"Grace & Gumption: The Cookbook delves into the kitchens, dining rooms and cookbooks of pioneering Fort Worth women for whom food played a significant role...local contributors uncovered actual recipes and conducted many interviews, and the result is not only a cookbook but an engaging look inside the women's lives." --Stephanie Allmon "Fort Worth Star-Telegram "